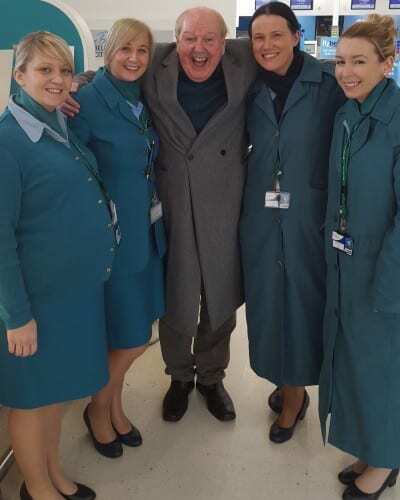 Jimmy Cricket has just finished a tour of his native Northern Ireland with a comedy show called You Must Be Joking. 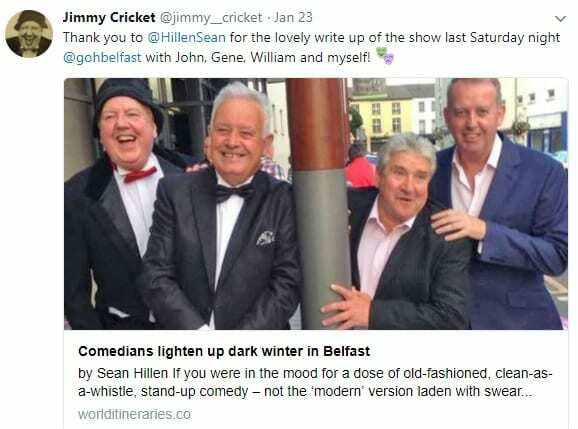 He featured alongside three fellow Ulster comedians, John Linehan (AKA May McFettridge), Gene Fitzpatrick and William Caulfield. 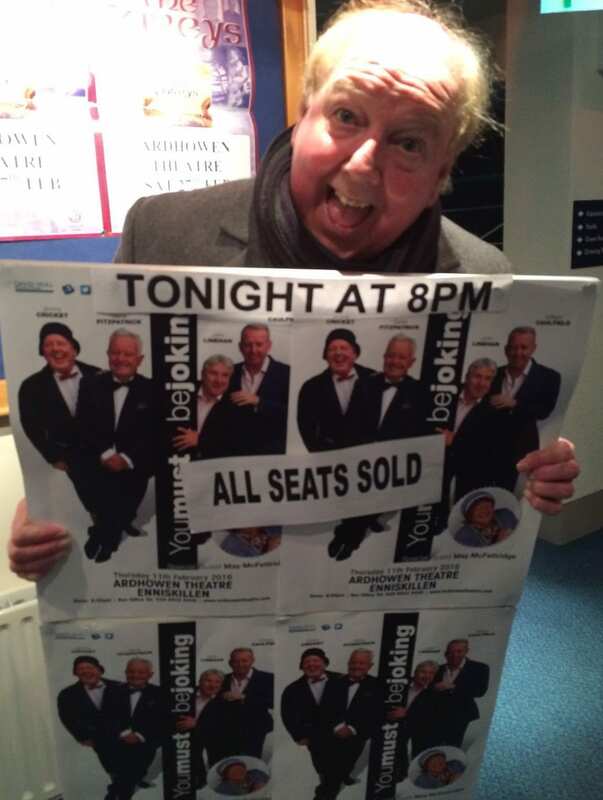 The tour was born out of the 2014 Cookstown Comedy Festival, as the line-up was put together for the first time there with huge success. This merited a full tour of the province in 2015, with this year’s edition continuing its popularity with shows at Grand Opera House in Belfast and the Millennium Forum in Derry, as well as at some of the major towns in the province. The crowds were marvellous and large in number everywhere, even to the point where several venues were sold out, including the Ardhowen Theatre in Enniskillen. The latest series of shows were organised by Northern Ireland’s leading tour promoter, David Hull Promotions. Jimmy said: “I have known David for a number of years, having first worked for him during the mid-80s when I first launched myself on to the national stage. 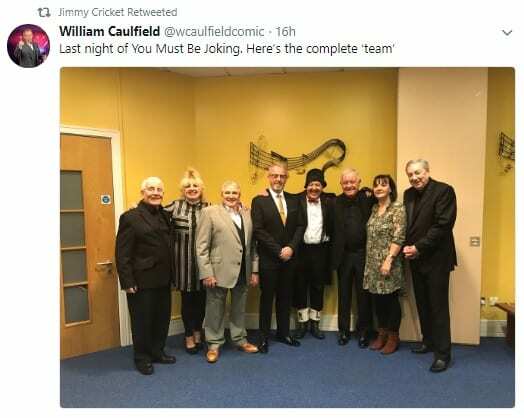 Jimmy Cricket is taking part in the 2016 edition of the You Must Be Joking tour, the first leg of which was at the Grand Opera House in Belfast. 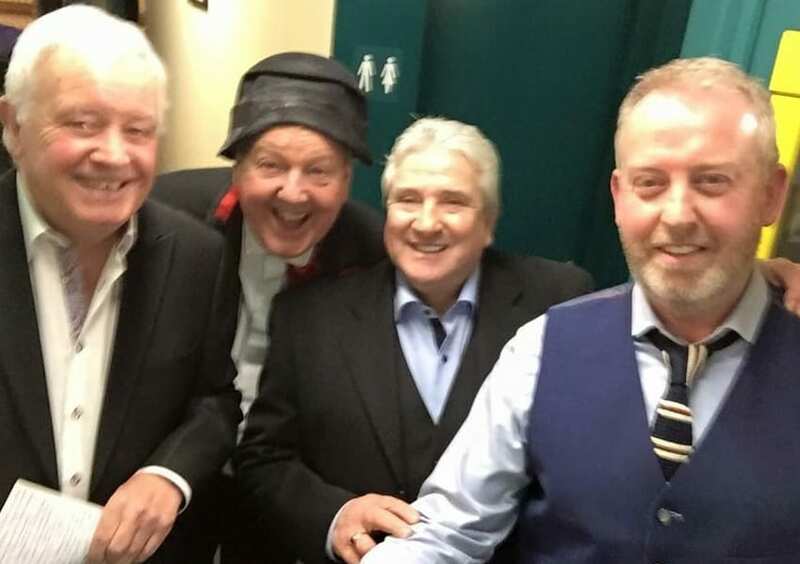 In the comedy show, which is aimed at the audiences of Northern Ireland, Jimmy features alongside three fellow renowned Northern Irish comedians, John Linehan (AKA May McFettridge), Gene Fitzpatrick and William Caulfield (all are pictured below right). 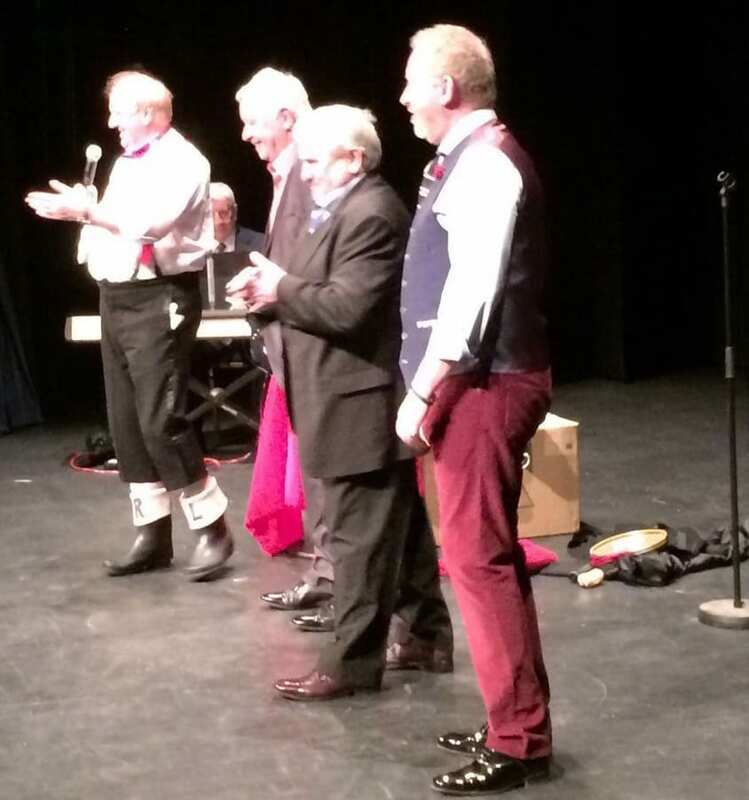 The tour was born out of the 2014 Cookstown Comedy Festival, as the line-up was put together for the first time there with huge success. Not only did the show gel and all four comedians complemented one another really well, there was a full house too! This merited a full tour of the province in 2015, with this year’s events continuing the interest in the show and its popularity. After the first 2016 date in Belfast, a slight gap in the tour schedule appeared before the remaining six dates. 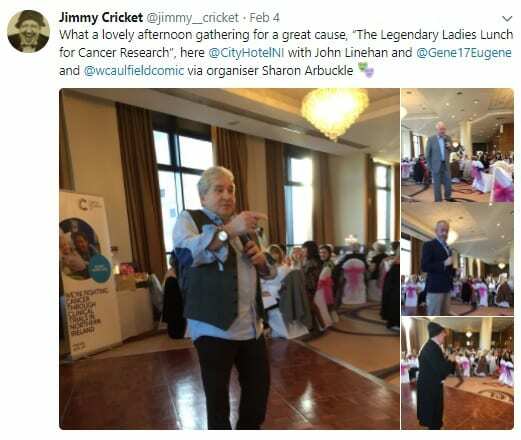 This has allowed Jimmy to get back to continue his commitments at the Lyndene Hotel in Blackpool where he has a spring season. When Jimmy arrived at George Best International Airport in Belfast city centre to catch his return flight to Manchester, he bumped into several Aer Lingus air stewardesses (pictured above right) – one of them had been to see the 2015 tour and her grandparents had been to see this year’s opener at the Grand Opera House. Well, I cannot believe we have come to the end of another year! When I look back over the last 12 months, I can safely say 2015 has been a special year for me. This is because not only did I turn 70 years old, but I was deeply humbled to receive the award of a papal knight from the Roman Catholic Church. Over the course of the last year I have bumped into many of you at some of the wonderful shows I have appeared in, around a host of different locations and venues. I should give special mention to the recent tour I have just finished with the Osmonds as part of the Andy Williams Christmas Spectacular. This was an amazing tour which visited venues that were incredibly well attended – many even sold out – and everywhere the show went the reception was warm and lively. So thank you for coming along and seeing one of these shows, or keeping in touch through my website, Facebook pages or Twitter feed. The first significant moment is scheduled for Saturday 16 January when the Bishop of Salford will formally preside over a ceremony to present me with my papal honour. So if I did not catch you during the last year, maybe I might get a chance to bump into you in 2016? 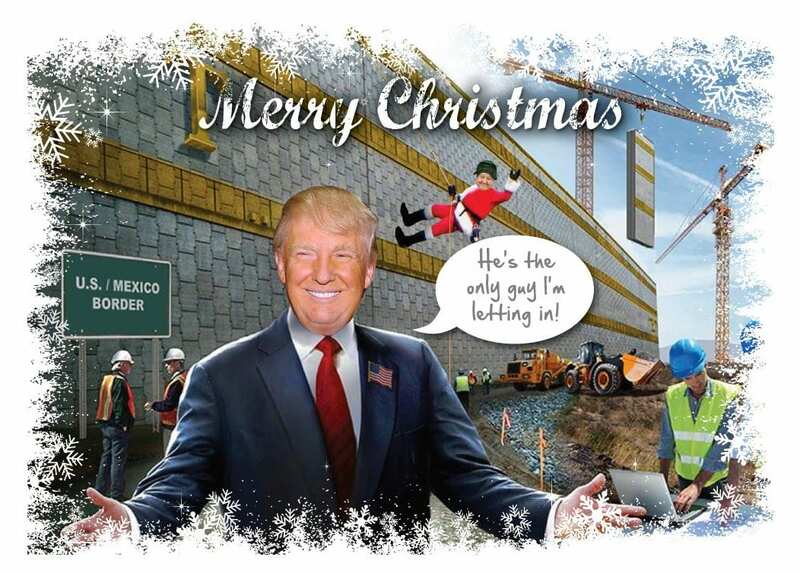 All that remains for me to do is to wish you and your family a very happy, peaceful and joyful Christmas season and a wonderful start to the New Year! 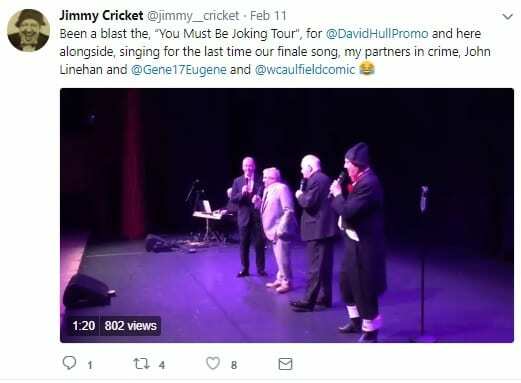 The You Must Be Joking tour that reunited Jimmy Cricket with three fellow well-known Northern Ireland comedians had a first-night sellout. 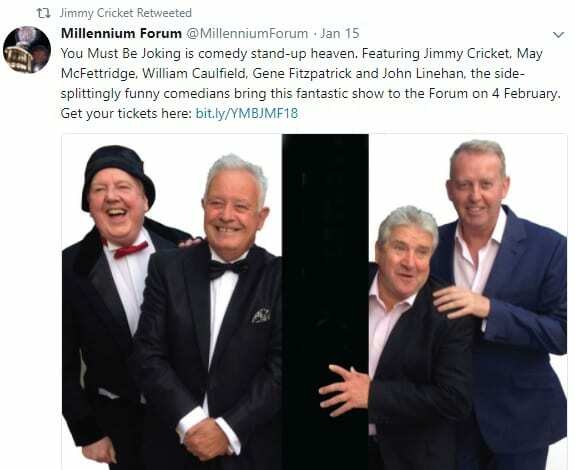 Jimmy headlined the series of comedy shows, which also featured John Linehan (aka May McFettridge), William Caulfield and Gene Fitzpatrick. It was a recreation of a successful format that was part of the 2013 Cookstown Comedy Festival. The tour was hosted by four major theatres across Northern Ireland, with the opening night playing to a full house at the Grand Opera House in Belfast. It then visited Newtonabbey and Derry before ending with a trip to the Market Place Arts Centre in Armagh. 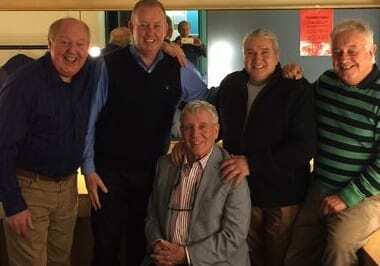 The quartet of entertainers also appeared on the Gerry Kelly radio show at the BBC Radio Ulster studio in Belfast. The tour was organised by Northern Ireland’s premier promotions company, David Hull Promotions, who are based in Belfast.